Israeli forces have continued with systematic attacks against Palestinian civilians and their property in the occupied Palestinian territory (oPt) for the reporting period of 27 November - 03 December 2014. During the reporting period, Israeli forces wounded 20 civilians in the West Bank and the Gaza Strip, including 8 children, a girl and an Italian solidarity activist. Seventeen of these civilians, including 7 children, the girl and the Italian activist, were wounded in the West Bank, while 3 civilians, including a child, were wounded in the Gaza Strip; 2 of whom were wounded in the border area while the third one was wounded in the sea. In the West Bank, in excessive use of force, on 01 December 2014, Israeli forces opened fire at a 22-year-old female from Beit Fajjar village, southwest of Bethlehem. As a result, she sustained 4 bullet wounds. Israeli forces claimed the girl attempted to stab a settler, but when the settler suspected her, she ran towards the way leading to her village. In the meantime, Israeli soldiers opened fire at her. On 03 December 2014, a Palestinian civilian was wounded when Israeli forces moved into Askar refugee camp, northeast of Nablus. Israeli forces used excessive force against peaceful protests organised by Palestinian civilians, international and Israeli human rights defenders in protest at the construction of the annexation wall and settlement activities in the West Bank. As a result, 7 civilians, including 5 children and an Italian activist, were wounded. In the same context, 8 Palestinian civilians, including 2 children, were wounded during other peaceful protests against Israeli practices in occupied Jerusalem. In the Gaza Strip, 3 Palestinian civilians, including a child, were wounded; 2 of whom were wounded in the border area while the third one was wounded in the sea. In the context of targeting fishermen in the Gaza Strip sea, Israeli navy forces opened fire 8 times at fishermen sailing within the fishing limits. In the West Bank, on 23 November 2014, a landmine of the Israeli forces' military remnants exploded and killed a 43-year-old shepherd in the northern Jordan valley, east of Tubas. On 20 November 2014, 4Palestinian civilians were wounded when Israeli forces moved into Askar refugee camp, northeast of Nablus. On the same day, a Palestinian child sustained a bullet wound to the right leg when Israeli forces moved into Deir al-Hatab village, northeast of Nablus. In addition, a 16-year-old child sustained a fracture in the leg when he fell to the ground while Israeli soldiers were chasing the protestors. On 22 November 2014, Israeli forces fired a sound bomb at a 45-year-old civilian in Sho'fat neighbourhood, north of East Jerusalem. As a result, he sustained minor wounds to the leg. On 25 November 2014, Israeli forces fired a gas canister at a 55-year-old civilian and his 18-year-old son while heading to a condolence house, east of the Old City in East Jerusalem. As a result, they sustained shrapnel wounds. In the same context, Israeli forces used excessive force against peaceful protests organised by Palestinian civilians, international and Israeli human rights defenders in protest at the construction of the annexation wall and settlement activities in the West Bank. As a result, 4 civilians, including 2 children and a woman, were wounded in al-Nabi Saleh weekly protest, northwest of Ramallah. In addition, a 17-year-old child sustained a bullet wound to the left leg in Kufor Qaddoum weekly protest, northeast of Qalqilya, while 7 Palestinian civilians, including 3 children,were wounded in other protests. In the Gaza Strip, in excessive use of force, on 23 November 2014, Israeli forces killed a Palestinian civilian, east of Jabalia, while hunting birds. 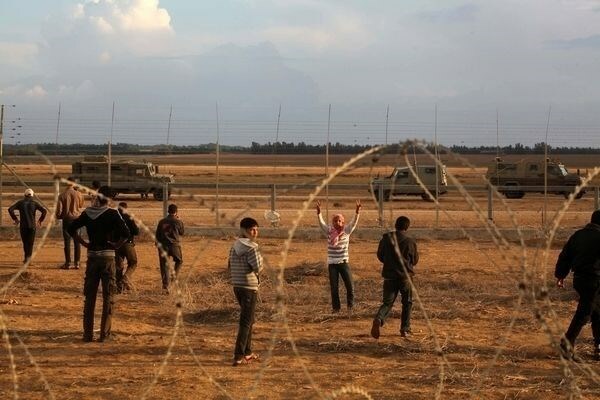 On 21 November 2014, a Palestinian civilian was wounded when Israeli forces stationed along the border fence, east of al-Shuhada cemetery, east of Jabalia, opened fire at a group of young men, who threw stones at the mentioned fence. On 23 November 2014, a 17-year-old child from Rafah sustained a bullet wound to the chest (the bullet entered and exited) while being present with his friends near the Airport Street, southeast of Rafah, 1,500 meters away from the border fence. During the reporting period, Israeli forces conducted at least 65 military incursions into Palestinian communities in the West Bank. During these incursions, Israeli forces arrested at least 90 Palestinians, including 21 children and 2 women. Thirty-nine of these civilians, including 10 children and a woman were arrested in Jerusalem. In the Gaza Strip, on 01 December 2014, Israeli forces stationed along the border, east of Deir al-Balah in the central Gaza Strip, arrested 17-year-old Palestinian and 21-year-old one while attempting to sneak into Israel through the border. In the context of bulldozing activities, on 01 December 2014, the Israeli municipality bulldozers demolished a house in al-Isawiya village, north of Jerusalem under the pretext of having no construction permit. On 03 December 2014, Israeli forces bulldozed a deserted building and 10 nearby stores at the entrance of Shufat refugee camp, north of Jerusalem, to expand the annexation wall. In the context of Israeli collective punishment policy, on 30 November 2014, Israeli forces summoned the wife of Ghassan Abu Jamal to al-Maskubya investigation center to formally inform her of the withdrawal of her family reunion document, which enables her to live in Jerusalem. As part of settlers’ attacks, on 30 November 2014, a group of Israeli settlers attacked a 26-year-old Palestinian civilian near the light train station. As a result, he sustained multiple wounds and was taken to al-Maqased Hospital. On the same day, the security guards of the light train station attacked a 23-year-old Palestinian civilian in the French Hill area, north of the Old City in Jerusalem. As a result, he sustained bruises to his neck and shoulders. During the reporting period, Israeli soldiers used excessive force against peaceful demonstrations organized by Palestinian civilians, international and Israeli human rights defenders in protest at the construction of the annexation wall and settlement activities in the West Bank. As a result, 7 demonstrators, including 5 children and an Italian solidarity activist, were wounded. In the same context, 8 Palestinian civilians, including 2 children, were wounded during protests organized against the Israeli forces' and settlers' attacks in al-Aqsa mosque in Jerusalem. Following the Friday prayer, on 28 November 2014, dozens of Palestinian civilians and international and Israeli human rights defenders organized a peaceful demonstration in Bil’in, west of Ramallah, in protest at the construction of the annexation wall and settlement activities. The demonstrators took the streets raising the Palestinian flags and headed to the liberated territories near the annexation wall. Early in the morning, Israeli forces closed all entrances to the city to prevent Palestinian civilians and international and Israeli human rights defenders from participating in the protests. Protestors marched by the annexation wall and tried to cross the fence. Israeli soldiers stationed behind the wall, in the western area, and a large number of soldiers deployed along it, fired live bullets, tear gas canisters, rubber-coated steel bullets, sound bombs and wastewater at them and chased them into the olive fields. As a result, a number of protestors suffered tear gas inhalation and others sustained bruises as Israeli soldiers beat them up. Around the same time, dozens of Palestinian civilians and Israeli and international human rights defenders organised a peaceful demonstration in al-Nabi Saleh village, southwest of Ramallah, in protest at the construction of the annexation wall and settlement activities. The demonstrators made their way in the streets raising the Palestinian flags and chanting slogans against the occupation and in support of the Palestinian unity resistance, and then they headed to the lands that the settlers are trying to rob by force near “Halmish” settlement. Israeli forces had closed all the entrances of the village since the morning to prevent Palestinian and international activists and journalists from participating in the demonstration. When they arrived at the aforementioned land, demonstrators were met by live bullets, tear gas canisters, rubber-coated steel bullets, sound bombs and skunk water and were chased into the village. As a result, 14-year-old male sustained a bullet wound to the right knee. In addition, many demonstrators suffered tear gas inhalation and other sustained bruises as Israeli soldiers beat them up. Also at approximately 13:20, Palestinian civilians and international solidarity activists organized a protest in the center of Kufor Qaddoum village, northeast of Qalqilya, heading to the eastern entrance of the village in protest against closing that entrance since the beginning of al-Aqsa Intifada with an iron gate. The demonstrators threw stones at Israeli soldiers, who fired sound bombs and tear gas canisters in response. As a result, 6 demonstrators, including 4 children and an Italian solidarity activist, were wounded. The Italian activist Patrick Kurici sustained a bullet wound to the chest and was taken to Ramallah governmental hospital. His wound was serious but his health condition is stable. Moreover, 4-year-old Abdul Rahman Mohammed Taha sustained a bullet wound to the right leg, a 13-year-old child sustained a bullet wound to the chest, a 16-year-old child sustained a bullet wound to the chest as well, a 17-year-old child sustained a bullet wound to the side and a 23-year-old male sustained a bullet wound to the right arm. On Friday afternoon, 28 November 2014, dozens of Palestinian young men gathered from different areas in Ramallah and al-Bireh around Ofer detention facility, southwest of Ramallah. They made their way towards the facility's gate, which was closed by Israeli soldiers. The protestors set fire to tires and threw stones and empty bottles at Israeli soldiers, who fired live ammunition, rubber-coated metal bullets, sound bombs and tear gas canisters in response. As a result, many demonstrators suffered tear gas inhalation and others sustained bruises as Israeli soldiers beat them up. Also following the Friday prayer, dozens of Palestinians gathered in front of Qalandya refugee camp, north of Jerusalem, in protest at the Israeli settlers' and forces' attacks in al-Aqsa mosque. Israeli heavily armed forces were deployed. The protestors set fire to tires and threw stones and empty bottles at Israeli soldiers, who fired live ammunition, rubber-coated metal bullets, sound bombs and tear gas canisters in response. As a result, 2 civilians were wounded and then taken to Palestine Medical Compound in Ramallah. Besides, a number of demonstrators suffered tear gas inhalation and others sustained bruises as Israeli soldiers beat them up. A 23-year-old young man sustained a bullet wound to the left leg and a 19-year-old young man sustained a bullet wound to the lower jaw. Following the Friday prayer, dozens of Palestinian civilians gathered at the eastern entrance of Aboud village, northwest of Ramallah, in protest at the Israeli policies. They threw stones and empty bottles at Israeli soldiers, who fired rubber-coated metal bullets, live ammunition, sound bombs and tear gas canisters. As a result, 4 civilians were wounded. Moreover, a number of protestors suffered tear gas inhalation, and others sustained bruises as Israeli soldiers beat them up. A 21-year-old young man sustained a bullet wound to the left ankle, a 19-year-old young man sustained a bullet wound to the right leg, a 21-year-old young man sustained a bullet wound to the right leg and a 26-year-old young man sustained a bullet wound to the left leg. Around the same time, dozens of Palestinian civilians gathered at the southern entrance of al-Jalazoun refugee camp, north of Ramallah, about 300 meters away from "Beit 'Eil" settlement, in protest at Israeli forces' and settlers' attacks in al-Aqsa mosque. The demonstrators threw stones and empty bottles at Israeli soldiers, who fired rubber-coated metal bullets, live ammunition, sound bombs and tear gas canisters. As a result, 2 children were wounded and then taken to Palestine Medical Compound in the city. A 15-year-old child sustained a bullet wound to the right thigh and a 15-year-old child also sustained a bullet wound to the left thigh. At approximately 11:00 on Saturday, 29 November 2014, dozens of Palestinian civilians gathered around the military checkpoint at the entrance of al-Shuhada Street, in the center of Hebron, in protest at closing the aforementioned checkpoint for the 9th consecutive day. Israeli soldiers fired sound bombs and tear gas canisters at the demonstrators, due to which many demonstrators suffered tear gas inhalation. A group of young men tried to reach the abovementioned street through bypass roads, where Israeli soldiers stopped them. 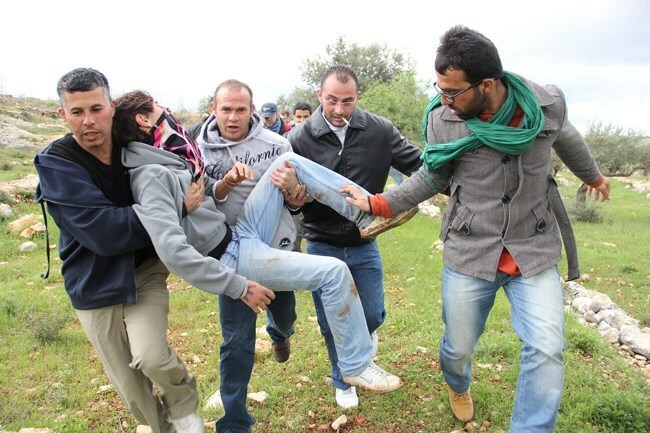 Settlers insulted and pushed the young men in front of Israeli soldiers, who did nothing to prevent them. It should be noted that Israeli forces closed the checkpoint and denied Palestinian civilians and school students from Tal al-Rumaida movement via the checkpoint under the pretext that a Palestinian set fire to the checkpoint. This checkpoint was established on the main street used daily by hundreds of civilians, due to which they take other long roads to reach their homes and workplaces. For almost 8 consecutive years, Israeli forces have continued to prevent the delivery of construction materials to the Gaza Strip. Two years ago, Israeli forces approved the delivery of limited quantities of construction materials for a number of international organizations in the Gaza Strip. On 17 September 2013, they allowed the entry of limited quantities of construction materials for the private sector. However, on 13 October 2013, they re-banned it claiming that these materials are used for constructing tunnels. Last week, Israeli forces allowed the entry of construction materials only for UNRWA and UNDP projects. As a result, construction works have completely stopped impacting all sectors related to construction and an increase in unemployment levels. During the 51-day Israeli offensive on the Gaza Strip in July and August 2014, Israeli authorities did not allow the entry of any construction materials. As a result, vital and infrastructure projects have been obstructed so far. · Hebron: Israeli forces have continued to impose severe restrictions on the movement of Palestinian civilians. At approximately 07:30 on Thursday, 27 November 2014, Israeli forces established a checkpoint at the entrance of Ezzna village and another on Wad Abu Risha road, west of Ezzna, west of Hebron. At approximately 20:00, Israeli forces established a checkpoint at the entrance of Abu al-‘Asja village, southwest of Doura, south west of the city. The checkpoint was removed and no arrests were reported. For the seventh consecutive day, Israeli forces have closed the military checkpoint which is established at the entrance of al-Shuhadaa Street, in the center of Hebron. The closure obstructed the movement of the residents of Tal al-Rumeida village, especially the movement of the students to their schools. The aforementioned street is the main pathway for the resident of the village. Its closure causes the residents to take longer roads to reach their houses and workplaces. At approximately 07:00 on Friday, 29 November 2014, Israeli forces established a checkpoint at the entrance of Beit ‘Awwa village, southwest of Doura, southwest of the city. The checkpoint was removed and no arrests were reported. At approximately 14:00 on Saturday, 29 November 2014, Israeli forces established a checkpoint at the northern entrance of Halhoul village, north of the city. The checkpoint was removed and no arrests were reported. At approximately 07:30 on Sunday, 30 November 2014, Israeli forces established a checkpoint at the entrance of Beit Kahel village, west of Hebron. The checkpoint was removed and no arrests were reported. At approximately 08:00 on Tuesday, 02 December 2014, Israeli forces established a checkpoint at the entrance of Ezzna village and another at the entrance of Kharasa village. Both checkpoints were removed later and no arrests were reported. · Ramallah: Israeli forces have continued to impose severe restrictions on the movement of Palestinian civilians. At approximately 10:00 on Thursday, 27 November 2014, Israeli forces established a checkpoint under Kharabtha al-Misbah village, southwest of Ramallah. The checkpoint was removed later and no arrests were reported. At approximately 20:30, Israeli forces reestablished their existence at ‘Attarah military checkpoint at the northern entrance of Beirzeit, north of the city. Later, they withdrew and no arrests were reported. At approximately 10:30 on Friday, 28 November 2014, Israeli forces established a checkpoint at the entrance of Nabi Saleh village, northwest of the city, and another one under Yabroud Bridge, northeast of the city. Both checkpoints were removed and no arrests were reported. At approximately 19:00, Israeli forces closed al-Wad intersection, which is the northern entrance of Bitello village, northwest of the city, with sand barriers. At approximately 10:30 on Saturday, 29 November 2014, Israeli forces established a checkpoint at the entrance of Nil’in village, west of Ramallah. At approximately 13:00, another checkpoint was established at the entrance of Deir ‘Amar village, northwest of the city. Both checkpoints were removed and no arrests were reported. At approximately 06:30 on Monday, 01 December 2014, Israeli forces established a checkpoint at the entrance of Betillo village and another at the entrance of Deir ‘Amar village. At approximately 16:30, another checkpoint was established under Ain Yabrud bridge, north of the city. At approximately 20:00, a similar checkpoint was established on al-Mu’rrajat road between Jericho and Ramallah. At approximately 21:30, Israeli forces reestablished their existence at ‘Attarah military checkpoint at the northern entrance of Beirzeit. All checkpoints were removed and no arrests were reported. · Jericho: Israeli forces have continued to impose severe restrictions on the movement of Palestinian civilians. At approximately 20:30 on Thursday, 27 November 2014, Israeli forces established a checkpoint at the entrance of al-Nuweima village. At approximately 21:30, another checkpoint was established at the southern entrance of the city. At approximately 22:00, Israeli forces established a checkpoint near al-Nabi Musa intersection on the main road between Jericho and Jerusalem. All checkpoints were removed and no arrests were reported. At approximately 09:30 on Friday, 28 November 2014, Israeli forces established a checkpoint near the entrance of Ain al-Diuk village, north of the city. At approximately 20:00, another checkpoint was established at the entrance of al-‘Oja village, northeast of the city. Both checkpoints were removed and no arrests were reported. At approximately 19:00 on Saturday, 29 November 2014, Israeli forces established a checkpoint at the northern entrance of Jericho. At approximately 20:00, another checkpoint was established at the entrance of al-Nuwima village. At approximately 21:00, Israeli forces established another checkpoint near the entrance of Fassail village. All checkpoints were removed and no arrests were reported. At approximately 09:30 on Monday, 01 December 2014, Israeli forces established a checkpoint at the entrance of Fassail village. At approximately 20:00, another checkpoint was established at the entrance of al-Nuweima village. Both checkpoints were removed and no arrests were reported. · Qalqilya: Israeli forces have continued to impose severe restrictions on the movement of Palestinian civilians. At approximately 14:30 on Thursday, 27 November 2014, Israeli forces established a checkpoint at the entrance of Azzoun village, east of the city. They reestablished the checkpoint at approximately 14:00. At approximately 14:30, a similar checkpoint was established between Azzoun and Kufur Thulth villages and another at the entrance of Izbat al-Tabib. At approximately 20:20, they established another checkpoint at the entrance of ‘Assala village, east of the city. All checkpoints were removed an no arrests were reported. At approximately 16:15 on Saturday, 29 November 2014, Israeli forces stationed at al-Muntar military tower on the main road, north of Azzoun, detained Murad Saqer Ibrahim Salim (19) and Muhammed Mashhour Abudl ‘Azia Salim (18) then released them at approximately 17:15 after the intervention of the Palestinian Liaison. · Tulkarm: Israeli forces have continued to impose severe restrictions on the movement of Palestinian civilians. At approximately 15:45 on Monday, 01 December 2014, Israeli forces stationed ‘Annab military checkpoint which is established on the road between Tulkarm and Nablus, east of the city, tightened their restriction against civilians and obstructed their movement. Later that day, he tightening ended and no arrests were reported. The tightening renewed at approximately 12:45 on Tuesday, 02 December 2014 and at approximately 17:45 on the same day. At approximately 09:00 on Tuesday, 02 December 2014, Israeli forces established a checkpoint on the main road between Tulkarm and Nablus near Beit Leed intersection. Later, the checkpoint was removed and no arrests were reported. · Jenin: Israeli forces have continued to impose severe restrictions on the movement of Palestinian civilians. At approximately 14:00 on Thursday, 27 November 2014, Israeli forces stationed at “Mafodotan” checkpoint which is established on the bypass road between Jenin and the northern villages of Tulkarm imposed more restrictions on civilians’ movement. Later, the tightening ended and no arrests were reported. At approximately 10:00 on Friday, 28 November 2014, Israeli forces stationed at “Mafodotan” checkpoint which is established on the bypass road between Jenin and the northern villages of Tulkarm imposed more restrictions on civilians’ movement. When Muhammad Sahrif Khalil “Zeid al-Kilani” (35) from Yaboud village passed through the checkpoint heading t Tulkarm, Israeli soldiers detained him and investigated with him. Later, they allowed him through. Later, the tightening ended and no arrests were reported. At approximately 20:30 on Saturday, 29 November 2014, Israeli forces estabslihed a checkpoint on the main road between Jenin, Tulkarm, and Nablus, near ‘Arraba intersection, west of Jenin. Later, the checkpoint was removed and no arrests were reported. · At approximately 10:00 on Friday, 28 November 2014, Israeli forces stationed at the electronic gates at the entrances of the Ibrahimi Mosque in the center of the Old City in Hebron arrested Hala Muslim Abu Sal (17) from al-‘Arroub, north of the city. They claimed that she was carrying a knife. She was taken to “Kiryat Arab” police station for investigation. · At approximately 16:00, Israeli forces stationed at the entrance of Beit Amr village detained Thaer Khalil Ahmed Abu Hashem (23) for two hours then arrested him and took him to an unknown destination. · At approximately 16:00 on Monday, 01 December 2014, Israeli forces established a checkpoint at the entrance of Sa’ir village, east of Hebron. They arrested Khalil Khader Shalalda and took him to an unknown destination. · On Monday evening, 01 December 2014, Israeli forces established a checkpoint on the main road between Tulkarm and Nablus and Jenin near ‘Arrab checkpoint. They arrested Nimer Bassam Abdullah Damaj (24) from Jenin refugee camp and took him to an unknown destination. · At approximately 11:00 on Monday, 01 December 2014, bulldozers belonging to the Israeli municipality demolished a house belonging to Ishaq Mostafa Hamdan in al-'Eisawiya village, north of occupied East Jerusalem, under the pretext of building without obtaining a license. The 200-square-meter house was built by Hamdan 2 years ago after it was demolished earlier in the same place. However, the Israeli municipality kept chasing him under the pretext of building on green areas, where building is not allowed, although the plot of land belongs to the abovementioned person. It should be noted that Hamdan was arrested by Israeli forces 2 months ago under the pretext of the accumulated building encroachments. · At approximately 08:00 on Wednesday, 03 December 2014, Israeli bulldozers demolished an abandoned building and 10 commercial stores at the entrance of Shu'fat refugee camp, north of east Jerusalem, to expand the annexation wall in the area. Local source in the area reported that over 300 soldiers moved into the refugee camp and deployed in the area. Snipers topped a number of high buildings. In the meantime, Israeli forces surrounded an abandoned building and 10 adjacent stores. The bulldozers then started demolishing the building and stores. 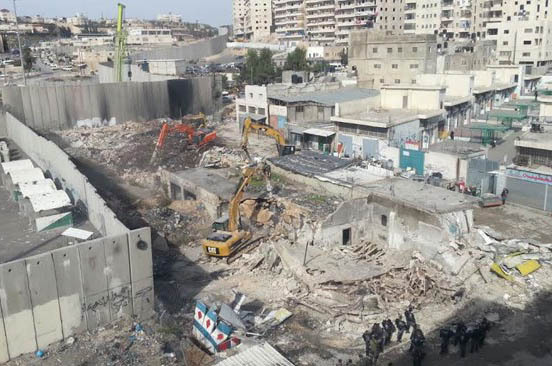 It should be noted that the stores were established in 2004 and the Israeli high court decided in 2013 to demolish the building, which was built in 1963, and its facilities built on 800 square meters. Israeli forces claimed they demolished them for "security reasons". A member of al-Dajani family said that Israeli forces have been working on expanding the annexation wall in the area. Therefore, they decided to confiscate the rest of the family's lands. It should be noted the family owned 11 dunums that had been confiscated at different intervals. · At approximately 10:00 on Sunday, 30 November 2014, Israeli forces summoned the wife of Ghassan Abu Jamal at al-Masqoubiya interrogation facility in occupied Jerusalem to officially inform her of the Israeli Interior Minister's decision to withdraw their family reunion document, which allows her to live in Jerusalem. Mohammed Mahmoud, lawyer at al-Dhameer institution, said to a PCHR fieldworker that the police had informed him on Thursday, 27 November 2014, that Mrs. Nadya Abu Jamal should refer to the abovementioned facility on Sunday morning to be informed of withdrawing her family reunion. It should be noted that the woman used to live in al-Sawahra village, east of East Jerusalem, before getting married to Ghassan Abu Jamal and used to renew the family reunion document annually to live with her family in Jabal al-Mukaber neighborhood. It is worth noting that Ghassan Abu Jamal (27) and his relative carried out the attack on a synagogue in Deir Yassin on Tuesday, 18 November 2014. A report conducted by the Islamic Resistance Movement, Hamas, documented a series of verified violations of Palestinians’ human rights perpetrated by the Israeli and Palestinian Authority (PA) apparatuses in the West Bank and Gaza during the month of November. According to the report, at least nine Palestinian civilians—six West Bankers, two Gazans, and a citizen of the 1948 Occupied Palestine— were shot dead by the Israeli occupation forces (IOF) in November. 241 Palestinians, including 39 children, eight ladies, and four ex-prisoners, were rounded up during the same period from the cities and areas of the West Bank and the Gaza Strip. The report further documented Israel’s demolition of 16 civilian homes, two residential tents, four barracks, and eight commercial stores throughout the West Bank. The IOF threatened to knock down more civilian homes and handed a number of Palestinian citizens orders to compulsorily evacuate their buildings at the soonest time possible. Hamas’s survey further kept record of Israel’s endorsement of bids to build 778 new settlement units in Occupied Jerusalem along with the misappropriation of 13066 dunums of Palestinian land tracts to that end. In a probe into the violations of human rights perpetrated by the PA security apparatuses, the report recorded 85 arrests among Hamas affiliates and resistance leaders. The PA forces further summoned 34 Palestinians affiliated with Hamas for interrogation and extended the detention-terms of at least 18 others. The PA handed back two Israeli settlers to the occupation authorities after they were caught creeping into Palestinians’ lands in southern Nablus city. Hemaya center for human rights said Thursday that the Israeli occupation army violated the Egyptian-brokered truce agreement in the Gaza Strip several times during last November. Last month, a Palestinian man was killed when Israeli soldiers opened fire at him during his presence in a border area inside Gaza, according to a report released by the center on Thursday. The report pointed out that Israeli army notably intensified last month its gunfire attacks off the coast of Gaza, where 10 armed assaults had been reported on fishermen and their boats. During the reporting month, two Israeli limited incursions took place, amid intensive gunfire, in Gaza border areas and nine Palestinian civilians suffered bullet wounds as invading Israeli troops opened fire indiscriminately on populated areas. The center also said that the Israeli army kidnapped six Palestinians from Gaza during the same period and closed Karam Abu Salem crossing for seven days.